Ten years after Volkswagen hinted at a return of the iconic Microbus, only to cancel the project, it's ready to try again. A new Microbus concept -- with an electric drivetrain and seating for six -- is making its debut at the Geneva auto show. VW says this Microbus -- known as the Bulli in Germany -- has a range of 300km (186 miles) on its 40-kilowatt-hour lithium-ion battery pack. The battery pack is sandwiched in the floor of the van and could be recharged in less than an hour, VW says, at an "electric refueling station" designed for EVs. Unlike the original Microbus, the concept's electric motor is positioned in front of the vehicle and drives the front wheels. The 114-hp motor delivers 199 lb-ft of torque. VW says the concept would run from 0 to 100kph in 11.5 seconds. Top speed is limited to 140kph. The engine compartment could also hold a small gasoline or diesel engine, VW says. 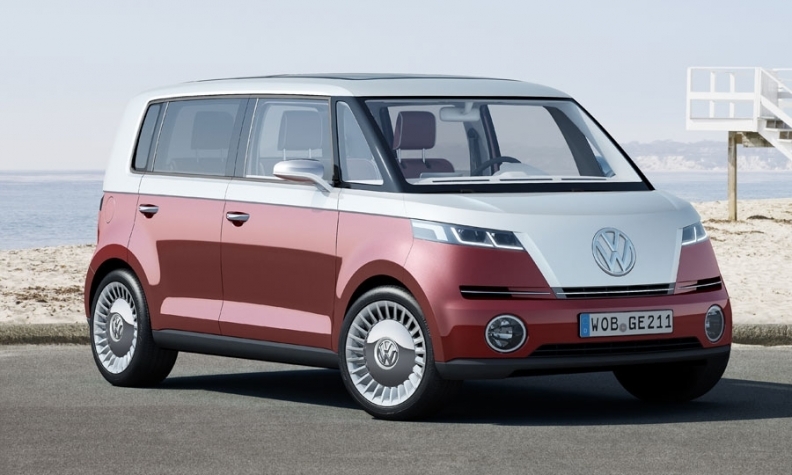 The concept makes use of heritage design cues, starting with a large, round, chrome VW emblem on its nose. But, compared with the original from 1950, this Microbus is a bit shorter and wider and doesn't stand as tall. The concept measures 3990mm (156 inches) long with a 2620mm wheelbase, stands 1700mm tall and is 1750mm wide. There is a two-tone paint scheme that breaks at the character line running down the van's side. Also, there are no sliding doors, the concept has two conventional rear doors. Inside, the Microbus concept seats six people with two bench seats. The front bench seat is split so that the center and passenger positions can fold flat. And the rear bench seat can be folded and stowed to increase cargo room. Or the bench seats can be flattened to create a bed. A docking station in the center of the instrument panel holds an iPad, which communicates with the steering-wheel controls and gauges. There is no gear shift -- a rotary knob selects park, reverse, neutral and drive.